Comedian, JB Masanduku hasn´t had such a smooth ride when it comes to his love life. We have witnessed his gross break up with wife, Tina Kaggia with whom they have 3 kids. Barely 2 days after breaking up with radio personality, Tina, JB was already in another woman´s arms, Jackie. Word was JB and Jackie were expecting a child, that he has clearly denied. However, JB is taking advantage of the moment, organizing marriage plans to his roughly 1 year girlfriend, Jackie Karanja. JB´s dowry plans are already underway, having already met Jackie´s parents. I have already done the first part of the dowry payment to her parents, in Kikuyu called ´Kuhada Ithigi´. This happened on January 5th this year at Jackie´s home in Wangige. He however hopes to complete the dowry, by August this year. We have dated for 8 months and in January this year we made it known officially to both our families. History JB and Jackie met at Mist Club in Nairobi, where she was hosting Karaoke and JB affirms: It was love at first sight because when I looked at her, I knew she was the one and definitely she is a nice lady. Tina Kaggia however, keeps reminding Jackie that her relationship with JB won´t last. JB hinted that the two are however, working on having a child. 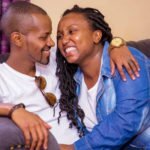 The post ¨When I looked at her, I knew she was the one¨ JB Masanduku already underway with dowry plans for his lady appeared first on Ghafla! Kenya.